TAKE A RIDE THROUGH 68 SCARIFYING ACRES OF SHEER HORROR . . . THIS 1-MILE HAUNTED HAYRIDE IS FULL OF YOUR WORST NIGHTMARES! 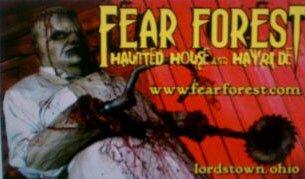 DON'T DARE MISS THIS TERRIFYING HORROR TRAIL THROUGH THE FEAR FOREST OF LORDSTOWN, OHIO, JUST MINUTES FROM YOUNGSTOWN AND WARREN, OHIO. 4 TERIFYING ATTRACTIONS, THE INSANEATARIUM HAUNTED HOUSE, THE HAUNTED HAYRIDE, THE PSYCHO PATH TRAIL, AND THE FORBIDDEN CORNFIELD.YOU WILL TRULY EXPERIENCE THE SCARE OF A LIFETIME!!! TAKE A RIDE THROUGH 86 SCARIFYING ACRES OF SHEER HORROR IN THE SCARIEST HAUNTED HOUSE IN THE YOUNGSTOWN/WARREN AREA. INSANE-A-TARIUM AND THE SCARIEST HAUNTED HAYRIDE, FEAR FOREST LOCATED ON RT. 45, BEHIND DAIRY QUEEN IN LORDSTOWN, OHIO. THE HAUNTED HOUSE AND ONE MILE LONG HAYRIDE IS FULL OF YOUR WORST NIGHTMARES! YOU WILL COME FACE-TO-FACE WITH FREAKISH FIENDS SUCH AS JASON, MICHAEL MYERS, LEATHERFACE, AND THE CREEPER!!! PREPARE TO BE MESMERIZED AS YOU PASS THROUGH THE AREAS ONLY VORTEX TUNNEL "WITCH" IS GUARANTEED TO LEAVE YOU SQUEAMISH! SO MAKE PLANS TO VISIT THE AREA'S #1 HAUNTED HOUSE, HAUNTED HAYRIDE, AND HAUNTED ATTRACTION, FEAR FOREST THIS FALL!!! Enjoyed this. Great haunted house. Hayride was long. Didnt scare me. Pysco path was good and so was the cornmaze. The haunted house ho was one of the best ive been to! I go to a haunted house every weekend in October. This one truly scared me. It was amazing.